Speak Up Planning Webinar Recording Now Available! Watch our “All About Speak Up!” Recorded Webinar!! As a kick off to Speak Up 2013 in your schools share our Speak Up Introductory Webinar recording with your school contacts. 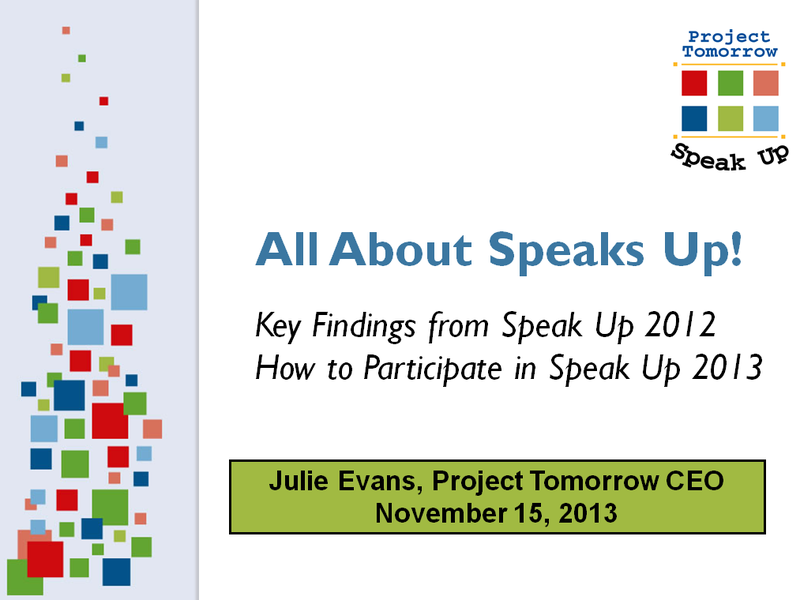 This 45 minute recorded webinar, hosted by Project Tomorrow’s CEO, Julie Evans, includes background information on Speak Up, benefits of participation, key Speak Up findings from last year’s survey as well as how your school or district can participate in Speak Up this year. The recorded webinar can be accessed via Blackboard Collaborate here: Speak Up 2013 Planning. The Speak Up National Research Project annually collects and reports on the authentic, unfiltered views of K–12 students, parents, and educators about critical digital age education and technology issues. The survey questions reflect many pertinent education topics impacting classrooms today—such as mobile learning, flipped classrooms, digital textbooks, virtual and blended learning, games, common core assessments and social media. Since 2003, more than 3 million K–12 education stakeholders have shared their ideas about digital learning through the Speak Up surveys. And we need your ideas too. Speak Up is currently open for input through December 20, 2013. There is no cost to participate; no limit on the number of surveys that can be submitted; and all data collected is 100% confidential. The survey is available to anyone in having a voice on critical education and technology trends. To “Speak Up,” simply visit www.speakup4schools.org/speakup2013 to take the survey. To learn more about Speak Up or to get your school, district or organization involved with Speak Up this year, please visit our website at www.tomorrow.org/speakup or contact Jenny Hostert on the Project Tomorrow team at jhostert@tomorrow.org / 949.609-4660 ext. 17. This entry was posted in Speak Up, webinar and tagged K-12, K-12 education, online class, Speak Up, Speak Up 2012 Data Findings, Speak Up 2013, Speak Up webinar on November 18, 2013 by Project Tomorrow. Are you attending the iNACOL Blended and Online Learning Symposium? Happy Monday! We hope you had a relaxing and fun filled weekend! Tomorrow’s teachers may have the keys to finally unlock the potential of online learning tools and strategies to transform teaching and learning, but much depends upon their experiences in their preparation program and how well future school leadership can support their expectations for essential technology tools and resources. In this session, we will review new Speak Up findings on this topic and discuss the research with a panel of teacher educators and school principals. Click here to learn more and sign up for the session! 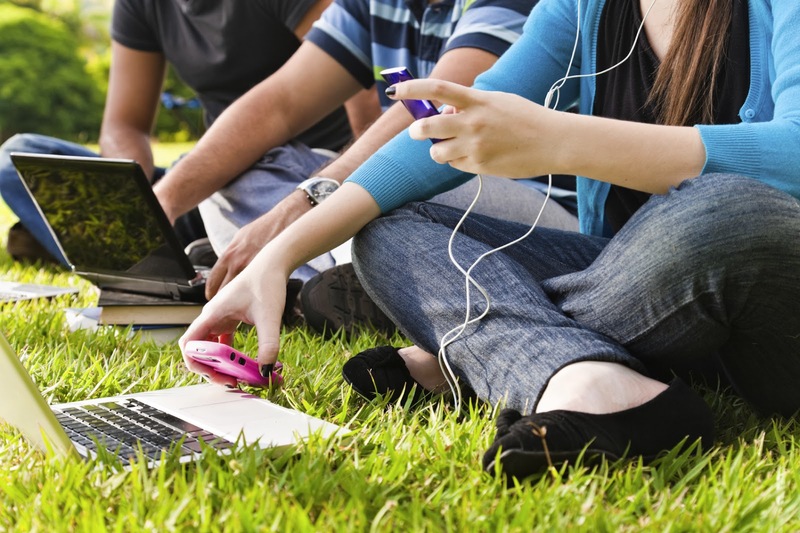 Online learning debates primarily focus on student outcomes. However, the real impact of leveraging online learning tools should be about changing teacher practice. The 2012 Speak Up National Research Project polled 56,000 teachers nationwide on the impact of online learning on their practice as well as student outcomes. In this session, we will review new findings around blended, flipped, and personalized learning and learn from a teacher panel about their experiences and expectations. One of the most challenging issues facing administrators, teachers and parents today is keeping up with the digital tools available for learning. This panel discussion will focus on the key findings on maximizing student learning from the 2012 survey conducted by the Speak Up National Research Project. Specifically, the panel member discussion, which will consist of teacher (s) and administrator (s), will comment on the results from the survey. Please be sure to check our website next week at: http://www.tomorrow.org/speakup/speakup_presentations.htmlfor copies of the powerpoint presentations! Have you participated in Speak up?! Please share your experiences below! And remember to share the Speak Up surveys with your network of friends and family- every voice counts! This entry was posted in Speak Up and tagged Conferences, Future Teachers, iNACOL, Julie Evans, Online Learning, Speak Up, Speak Up 2012 Data Findings, Speak Up presentations on October 28, 2013 by Project Tomorrow.